Up north of the 49th parallel, a great wave of co-operative development is transforming the food system. Like the United States, Canada has a food system in grave need of healing. Communities across the country face challenges in accessing healthy, culturally appropriate, and affordable foods. Many urban communities experience the hollowing out of downtown cores, while rural communities witness grocery stores leaving for greener pastures. Because food is not optional, many communities are beginning to self-organize in order to address the gaps and create greater community sufficiency, using the oldest form of social enterprise in the book—the cooperative model. In a county of 35 million people, Canada’s 9,000 co-operatives and credit unions have more than 18 million members1. Some 150,000 people work for Canada’s co-operatives, which own total assets of approximately $330 billion2. Home to 13.5 million people and spanning a million square kilometres3 (415,000 square miles), Ontario’s landscape is filled with great tracts of forest and fresh water and contains more than half of Canada’s Class 1 farmland. Food and farming is the province’s top employer by sector4. According to the Ontario Co-operative Association (OnCo-op), there are more than 1,300 co-operatives in Ontario, and along with renewable energy, local and organic food co-operatives are the fasting growing sector of the province’s co-operative economy5. Six years ago, OnCo-op hosted the first meeting of 12 food co-ops—what was to become the Local Organic Food Co-ops (LOFC) Network. During those years, the Network has grown phenomenally. Invitations to the Network’s 2015 Assembly went to over 90 startup, emerging, and/or established food and farming co-ops within Ontario. The province seems to have a healthy appetite for gastrodemocracy! The LOFC Network is composed of co-operatives at differing stages of growth and maturity, operating under a variety of organizational models, including farmer-owned, eater-owned, worker-owned, and multi-stakeholder co-ops (a model on the rise). The co-ops undertake activities reflective of the diversity of needs within the food system itself, and as such the Network includes seed growers, farm and food producers, processors, distributors (delivering by cargo bicycle, truck, and plane), retailers, farmers markets and community-supported agriculture programs (CSAs), microbreweries, cafés and restaurants, and even food waste recovery biofuel co-operatives. Unique by comparison with our U.S. food co-op association cousins, the LOFC Network’s co-ops span the food cycle, supporting a system or circular economy that includes cradle-to-cradle sustainability principles and practices. The joint mission of the co-operatives through the LOFC Network is to build an equitable, agroecological, place-based, and co-operative food system. The Network honors food producers at the core of work and activities, recognizing the immense wisdom and strong business acumen they bring to the development of healthy and resilient food systems. Collectively, Ontario’s co-ops are weaving the LOFC Network as a platform for food system transformation in Ontario that rests upon the seven principles of co-operative identity, with particular emphasis on Principle 6—co-operation among co-operatives—in addition to generosity, reciprocity, an ethic of care, and a great amount of shared work. The member co-operatives are encouraged to use the Network as a platform to do the kinds of work they most need to do, to enhance their own work in conjunction with the work of others, and to build the platform collectively using each co-op’s strengths. Relationships comprise the strategy at the heart of the LOFC Network—connected, activated, and cultivated—so that we might leverage the power of our interconnectedness for the collective good. The LOFC Network is guided by a steering committee composed of representatives from the co-operatives themselves, and it is staffed by a full-time animator and part-time food hub project coordinator. The staff positions are supported by the Ontario Natural Food Co-op, a second-generation natural foods distributor situated in Mississauga, Ont., which has hosted the LOFC Network since 2011; and supported as well by the Ontario Ministry of Agriculture and Rural Affairs, which approved a Local Food Act in 2013 and complementary funding for local food initiatives. A grant from the Local Food Fund in 2014 has allowed the LOFC Network to pursue what is Canada’s first regional food hub project, providing capacity building, business planning, regional local food forums, and collaboration among four regional food hubs and associated network partners and stakeholders. The four food hubs are in various stages of development by existing local food co-ops. The outcomes for the projects include templates for food hub development and online resources (toolkits, recordings, etc.) for food hubs in Canada. Each region also will host a forum offering information, networking, and training on food hubs. The four co-op leads are True North Community Co-op (North), Eat Local Sudbury Co-operative (Central), On the Move Organics (West), and Ottawa Valley Food Co-operative (East). Strong partnerships both within and beyond the co-operative sector are a vital ingredient in the Network’s development and success. Over the last four years, the Network has collaborated with many provincial and national organizations, including Sustain Ontario: The Alliance for Healthy Food and Farming; the Ecological Farmers Association of Ontario; the Ontario Co-operative Association; Food Secure Canada; and Co-operatives and Mutuals Canada. The Network’s activities are framed by three central objectives: learn, connect, and build. 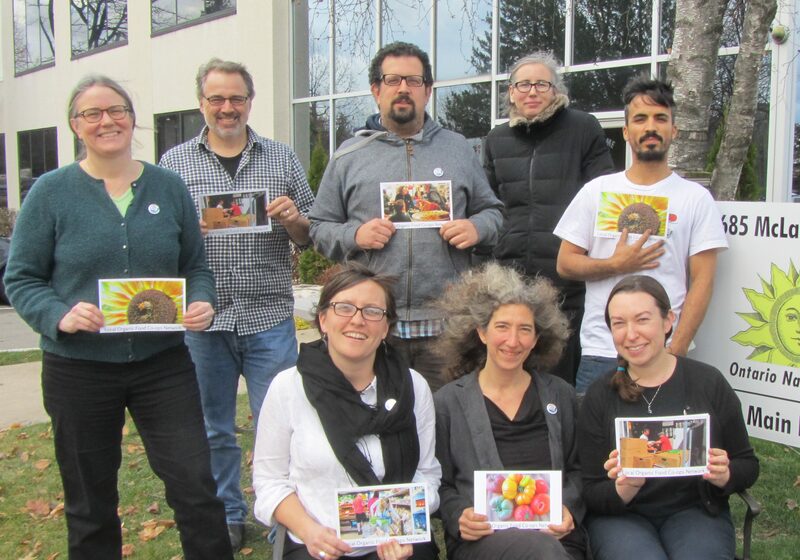 The LOFC Network is committed to supporting the co-learning of its members through offering many opportunities for the co-ops to share information, access training, and deepen their understandings of co-operative enterprise and the food system’s many challenges and opportunities. Quarterly virtual campfires centered upon specific themes are held as a means to gather co-operators together for informal dialogue on the most pressing topics at hand. This peer-to-peer learning style is given preference at annual Network assemblies, as well as through the 2015 regional food hub forums, which give co-ops the floor to share their best practices and lessons learned with their members and neighbouring co-operatives. Co-operatives have an excellent survival rate more than twice the success rate of conventional businesses. There are many reasons for this, but an important ingredient is the knowledge sharing and mutual support that co-operatives provide each other. The Network constantly strives to connect its members and other actors in the co-operative food system (including small enterprise and independent businesses) to co-operatively and democratically scale out (rather than scale up) for increasingly sustainable, ecological, and fair local food production and distribution. These interconnections support the individual co-operatives to build their capacity and strengthen their businesses. By running effective operations, Network co-ops raise the profile of co-operative enterprises within their communities and demonstrate the power of the co-operative model to turn ideological commitments into lived realities. Through the strong co-op to co-op relationships fostered within Network assemblies, events, and virtual platforms, the Local Organic Food Co-ops are working toward value-chain and trade-route development. The regional food hub project is directly supporting producer members and partners of Network co-ops in moving businesses that are interested in doing so toward wholesale opportunities, equipping them with valuable tools, skills, and information to manage risk and make informed decisions. For those producers working on value-added goods, the Ontario Natural Food Co-op’s private label of exclusively Ontario-grown and processed foods offers an additional avenue through which to develop the co-operative value chain. The Local Organic Food Co-ops Network is supporting communities in creating and sustaining gastrodemocracies—places to practice good health, community sufficiency, food sovereignty, and participatory democracy through active membership. With great collective wisdom and energy, we are able to build up rich soils in which to sow the seeds of our burgeoning movement, resilient as an ecosystem of co-ops across Ontario in our wide diversity of assets and strengths.